LONDON (Reuters) - The World Health Organization issued a stern warning on Friday to scientists who have engineered a highly pathogenic form of the deadly H5N1 bird flu virus, saying their work carries significant risks and must be tightly controlled. The United Nations health body said it was "deeply concerned about the potential negative consequences" of work by two leading flu research teams who this month said they had found ways to make H5N1 into a easily transmissable form capable of causing lethal human pandemics. 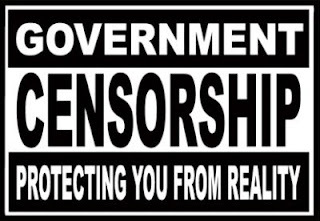 The work by the teams, one in The Netherlands and one in the United States, has already prompted an unprecedented censorship call from U.S. security advisers who fear that publishing details of the research could give potential attackers the know-how to make a bioterror weapon. The U.S. National Science Advisory Board for Biosecurity has asked two journals that want to publish the work to make only redacted versions of studies available, a request to which the journal editors and many leading scientists object. In its first comment on the controversy, the WHO said: "While it is clear that conducting research to gain such knowledge must continue, it is also clear that certain research, and especially that which can generate more dangerous forms of the virus....has risks." H5N1 bird flu is extremely deadly in people who are directly exposed to it from infected birds. Since the virus was first detected in 1997, about 600 people have contracted it and more than half of them have died. But so far it has not yet naturally mutated into a form that can pass easily from person to person, although many scientists fear this kind of mutation is likely to happen at some point and will constitute a major health threat if it does. Flu researchers around the world have been working for many years trying to figure out which mutations would give H5N1 the ability to spread easily from one person to another, while at the same time maintaining its deadly properties. The U.S. National Institutes of Health funded the two research teams to carry out research into how the virus could become more transmissible in humans, with the aim of gaining insight on how to react if the mutation occurred naturally. During the H1N1 swine flu pandemic in 2009-2010, many developing countries complained they had no life-saving antivirals or vaccines to combat the new virus, despite having made samples of the virus available to researchers and pharmaceutical companies to develop the medicines. It is normally laboratories in wealthy developed countries that have the level of scientific expertise needed to work on complex flu viruses, while bird, or avian, flu viruses themselves often come from less well developed Asian countries. A new Pandemic Influenza Preparedness Framework was agreed and adopted by all WHO member states in May 2011 to set rules for sharing flu viruses that have pandemic potential, and sharing the benefits of the expertise gained. "WHO considers it critically important that scientists who undertake research with influenza viruses with pandemic potential samples fully abide by the new requirements," the U.N. agency said in its statement. The WHO admitted why before the H1N1 was coercively injected into the population-- to "prime the public in advance of an epidemic". That would be cool to post that link here. Hot off the Journal of Virology Press!!! â€œSwine influenza was first recognized as a disease entity during the 1918 â€œSpanish fluâ€� pandemic. The aim of this work was to determine the virulence of a plasmid-derived human 1918 pandemic H1N1 influenza virus (reconstructed 1918, or 1918/rec, virus) in swine using a plasmid-derived A/swine/Iowa/15/1930 H1N1 virus (1930/rec virus), representing the first isolated influenza virus, as a reference. Four-week-old piglets were inoculated intratracheally with either the 1930/rec or the 1918/rec virus or intranasally with the 1918/rec virus. A transient increase in temperature and mild respiratory signs developed postinoculation in all virus-inoculated groups. In contrast to other mammalian hosts (mice, ferrets, and macaques) where infection with the 1918/rec virus was lethal, the pigs did not develop severe respiratory distress or become moribund. Presented data support the hypothesis that the 1918 pandemic influenza virus was able to infect and replicate in swine, causing a respiratory disease, and that the virus was likely introduced into the pig population during the 1918 pandemic, resulting in the current lineage of the classical H1N1 swine influenza viruses. Nostalgia has its place, but raising a lethal virus from the dead and infecting little piglets with it seems to take longing for the bad old days a bit far. Canâ€™t blame Canada for the Zombie virus idea, though. The initial effort was led by a molecular pathologist at the Armed Forces Institute of Pathology in Rockville, Maryland. He and his team spent 10 years piecing together the deadly virus in a lab at the CDC in Atlanta. They built their Zombie virus from pieces of wax-encased lung tissue that were preserved from the autopsies of two soldiers who were among the 1918 fluâ€™s 675,000 American victims, and also from the frozen body of an Inuit woman buried in the Alaska permafrost after dying from the virus in November of 1918. Oh, and we canâ€™t blame the Spanish, either, for the 1918 â€˜Spanishâ€™ flu pandemic. The Irish Examiner reports about the real origin of that catastrophe here. â€œRyle would have us believe that all those American soldiers who died from non-combatant causes may have died from Spanish flu. But US Army records show that seven men dropped dead after being vaccinated. Army records also reveal that after vaccination became compulsory in the US Army in 1911, not only did typhoid increase rapidly but all other vaccinal diseases increased at an alarming rate. The army doctors knew all these cases of disease and death were due to vaccination and were honest enough to admit it in their medical reports. When army doctors tried to suppress the symptoms of typhoid with a stronger vaccine, it caused a worse form of typhoid paratyphoid. But when they concocted an even stronger vaccine to suppress that one, they created an even worse disease - Spanish flu. Funny how a few short years after the Zombie virus was resurrected that a another mysterious new H1N1 virus has flashed around the globe. And some scientists have even said that this new virus is very similar to the Zombie virus. Unfortunately youâ€™ll note that the Sunshine Project is no longer shining its light on mistakes and accidental releases of deadly pathogens by biodefense research labs. Their work ended without explanation a few months after they reported a series of violations made by a lab in Texas. At least their website is archived for now. Makes you wonder where this new â€˜muttâ€™ H1N1 virus really originated, doesnâ€™t it? Advisory Group and provided the seed funding for the Pacific Health Summit. International, Sanofi Pasteur, and Omnivestâ€”followed suit with contributions. In 2009, sanofi-aventis CEO Chris Viehbacher announced a donation of 100 million doses to the stockpile. January 11, 2012 RSS Feed Print The days of medical masks at airports and widespread panic may be coming backâ€”that's because at least 12 humans are believed to have been infected with a new strain of swine flu that's not covered by this season's vaccine. The new swine flu strain, H3N2v, has shown at least some potential for human-to-human transmission in those 12 individuals, which makes it especially dangerous. Between 2009 and mid-2010, more than 17,000 people died worldwide from the highly contagious H1N1 swine flu strain, leading the World Health Organization to call the strain a pandemic. The 12 people with the new swine flu strain live in Indiana, Iowa, Maine, Pennsylvania, and West Virginia. Officials for the Centers for Disease Control say the sample size of H3N2 infections is too small to know whether it will pose a threat to the population at large. "Is FEMA & DHS preparing for mass graves and martial law near Chicago ?" â€¢ In late December 2008 municipal officials were invited to Indianapolis for a briefing on the state of Indiana. There were told if industry were to collapse for example GM going bankrupt resulting in mass unemployment a depression would soon follow and municipalities could expect to loose 40% of their funds. â€¢ Every county in the nation would be required to prepare a Hazard Mitigation Plan. â€¢ The county should prepare a plan to vaccinate the entire population within 48 hours and practice the plan several times. â€¢ FEMA inquired to where mass graves could be placed in the county and would they accept bodies from elsewhere. â€¢ The sheriffs department via the state sheriff association was told that no .223 ammunition rounds would be available as the military would be purchasing all stocks. â€¢ The county was asked to make plans for hardening of police and fire stations, putting in hardened bunker type buildings around town. â€¢ The county was asked to make plans for the possibility of up to 400,000 refugees from Chicago. I had a copy of this laying around on a CD so I uploaded it to youtube. Here's another older one .. remember this? Truckers getting paid massive amounts of money to truck "flu". Common sense dictates that developing a virus is litteraly insanity, what kind of *&$( would do this, for money, fringe genuises lost in their world of science, or sold out traitors that have known from day one this is a method of extermination that can be perpetrated on humans and made ot appear as if it is a natrual virus that has mutated. I will never take a shot, not will any of my family or friends, and those who have the capacity to interpret the truth. Annual flu shots might soon become a thing of the past, and threats such as avian and swine flu might disappear with them as a vaccine touted as the "holy grail" of flu treatment could be ready for human trials next year. That's earlier than the National Institutes of Health estimated in 2010, when they said a universal vaccine could be five years off. By targeting the parts of the virus that rarely mutate, researchers believe they can develop a vaccine similar to the mumps or measles shotâ€”people will be vaccinated as children and then receive boosters later. That differs from the current '60s-era technology, according to Joseph Kim, head of Inovio Pharmaceuticals, which is working on the universal vaccine. Each year, the seasonal flu vaccine targets three or four strains that researchers believe will be the most common that year. Previous seasons' vaccines have no effect on future strains of the virus, because it mutates quickly. The seasonal vaccine also offers no protection against outbreaks, such as 2009's H1N1 swine flu. A universal vaccine would offer protection against all forms of the virus. "It's like putting up a tent over your immune system that protects against rapidly mutating viruses," Kim says. At least two other companies are working on a similar vaccine. In late 2010, Inovio earned a $3.1 million grant from the National Institutes of Health to work on the vaccine. "It's a completely different paradigm than how [the vaccines] are made seasonably every year," Kim says. In late 2011, two research groups created a strain of H5N1 bird flu that could be passed from human to human, leading the World Health Organization to issue a statement that said they were "deeply concerned about the potential negative consequences" that publishing their research could cause. Some news outlets have called the new strain "engineered doomsday" and wondered whether terrorist organizations could create and distribute a similar virus. Kim says not to worry. "I am very certain our vaccine can already neutralize that newly made virus," he says. "We're trying to get our hands on it." Inovio is working on vaccines that'll protect against other strains, such as H3N2, which is seen in a newly-emerged swine flu virus. The scientists who altered a deadly flu virus to make it more contagious have agreed to suspend their research for 60 days to give other international experts time to discuss the work and determine how it can proceed without putting the world at risk of a potentially catastrophic pandemic. Suspensions of biomedical research are almost unheard of; the only other one in the United States was a moratorium from 1974 to 1976 on some types of recombinant DNA research, because of safety concerns. A letter explaining the flu decision is being published in two scientific journals, Science and Nature, which also plan to publish reports on the research, but in a redacted form, omitting details that would let other researchers copy the experiments. The letter is signed by the scientists who produced the new, more contagious form of the flu virus, as well as by more than 30 other leading flu researchers. Dr. Fauci and others who support the research say it may help explain how flu viruses that start out in animals adapt to humans and become transmissible, and therefore able to cause pandemics. That information, the researchers say, could help them recognize viruses on the way to developing pandemic potential. Recently, the teams in Rotterdam and Madison announced that they had produced a form of H5N1 with mutations that allowed it to â€œgo airborne,â€� meaning that it spread through the air from one ferret to another. Presumably, though not certainly, the virus could spread in the same way among people. Dr. Fouchier said he was surprised by how easy it was to change the virus into the very form that the world has been dreading. Now, scientists around the world will have to grapple with what to do with Dr. Fouchierâ€™s creation. An earlier version of this article misstated that Dr. Anthony Fauci was head of the National Institutes of Health. The continuous threat of an influenza pandemic represents one of the biggest challenges in public health. Influenza pandemics are known to be caused by viruses that evolve from animal reservoirs, such as birds and pigs, and can acquire genetic changes that increase their ability to transmit in humans. Pandemic preparedness plans have been implemented worldwide to mitigate the impact of influenza pandemics. A major obstacle in preventing influenza pandemics is that little is known regarding what makes an influenza virus transmissible in humans. As a consequence, the potential pandemic risk associated with the many different influenza viruses of animals cannot be assessed with any certainty. Recent research breakthroughs identified specific determinants of transmission of H5N1 influenza viruses in ferrets. Responsible research on influenza virus transmission using different animal models is conducted by multiple laboratories in the world using the highest international standards of biosafety and biosecurity practices that effectively prevent the release of transmissible viruses from the laboratory. These standards are regulated and monitored closely by the relevant authorities. This statement is being made by the principal investigators of these laboratories. ...multiple laboratories in the world using the highest international standards of biosafety and biosecurity practices that effectively prevent the release of transmissible viruses from the laboratory. So is this BSL-4 or BSL-3??? In April 2008, the National Institutes of Health (NIH) wrote to the UW-Madison, saying it was "extremely concerned" that experiments occurring here had "serious potential consequences to public health." Documents recently released to me in response to an open records request show that a graduate student aided by others genetically modified undisclosed "select agents" to be resistant to antibiotics. They did it without NIH approval, which is required. "Select agents" are infectious diseases considered by the U.S. government as having the potential to pose substantial harm to human, animal or plant health. The names of the specific "select agents" are redacted from the documents (see here). When the violations were discovered and reported by the university, more than 3,000 vials of unapproved antibiotic-resistant "select agents" had to be destroyed. The investigation remains open. In a letter to UW-Madison Chancellor Biddy Martin, a campus committee said the university wasn't in compliance with NIH guidelines because of "gross and chronic" understaffing. Such admissions should raise red flags about the UW's existing Biosafety Level 3 (BSL-3) labs, and perhaps especially its plans to open a new one at the Primate Research Center, just a block off Regent Street. University officials say this new lab will study SARS, bird flu and tuberculosis, and will rely on a system called BioBubbles to contain the germs. BioBubbles are frames with flexible plastic sheeting hung over them, something like portable greenhouses. BioBubbles were designed for quick deployment in temporary emergency situations, like the 2001 anthrax attacks. BSL-3 labs use biosafety cabinets that are supposed to keep the germs from escaping into the rest of the lab and potentially into the community. Leaks in biosafety cabinets manufactured by the UW-Madison have led to workers being infected with the germs they were studying, according to an Associated Press article in January. At Texas A&M, lab workers were infected with the bioweapons agent brucella, and in Seattle, workers were infected with tuberculosis. The university stopped manufacturing these cabinets at the end of 2008, citing potential huge liability costs. Infectious diseases are grouped by the risks they pose. The most dangerous diseases are studied in Biosafety Level-4 labs (BSL-4), like the laboratory that the university wanted to build in the town of Dunn. (The site was passed over by an NIH selection committee.) People working in these labs wear full-body spacesuits connected to air hoses. There are only four BSL-4 labs operating in the U.S. Just below them, in safety procedures, are the BSL-3 labs. [size=14t]UW-Madison flu researcher Yoshihiro Kawaoka works out of an underground BSL-3 lab at University Research Park[/size]. It has 10-inch-thick crack-resistant walls and, according to a 2006 article in On Wisconsin, resembles "a land-bound submarine crafted of concrete." This lab was built after the NIH called a halt to Kawaoka's Ebola research in 2007, citing his lack of proper biosafety. A few years earlier, researchers around the world expressed alarm that Kawaoka was studying the 1918 Spanish flu in a BSL-3 lab. The Spanish flu is the most virulent and deadly disease ever encountered. The primate center lab poses special risks. Isthmus readers know that monkeys sometimes escape from their cages ("My Monkey," 5/16/09). Would an infected berserk monkey be able to push his way through the plastic sheeting? And no matter how secure a lab is, there is always the human factor. What assurances do we have that a person given access to deadly germs would not, through accident or design, use them to cause infection? The new BSL-3 infectious disease lab that the university wants to create at the primate center poses needless serious threats to the community. We know from the university's "gross and chronic" biosafety understaffing that it doesn't take biosafety very seriously. Should neighbors bet their family's safety on a promise to change? We don't need a new BSL-3 lab in a residential neighborhood. The university says forthrightly that the proposed lab will allow it to attract more research dollars. That's not a strong enough reason to put the community at an increased risk of accidental infection with diseases like SARS or the plague. protein. Because the modified virus is not capable of replicating on its own, it can be used to screen for compounds that interfere with viral replication and packaging without being dangerous to normal cells or requiring BSL-4 containment. â€¢ Drugs already are approved for other uses. â€¢ Inhibitors can be used alone or in conjunction with other antiviral, prophylactic or therapeutic compounds. In addition to Kawaoka, who also holds an appointment at the University of Tokyo, authors of the new study include Peter Halfmann, Jin H. Kim and Gabriele Neumann of UW-Madison; Hideki Ebihara and Takeshi Noda of the University of Tokyo; and Heinz Feldmann of the Public Health Agency of Canada. Sep 25, 2007 (CIDRAP News) â€“ Researchers at the University of Wisconsin at Madison (UW-Madison) worked on Ebola virus genetic material in a lab that lacked the required security measures, and federal agencies responsible for monitoring compliance didn't notice the problem, a watchdog group that monitors biodefense research safety reported recently. UW-Madison's institutional biosafety committee (IBC) wrongly allowed well-known influenza researcher Yoshihiro Kawaoka to work with Ebola genetic material in a biosafety level 3 (BSL-3) lab, though federal rules require use of a BSL-4 lab for such work, the Sunshine Project, based in Austin, Tex., reported on Sep 19. BSL-4 is the highest biosecurity rating. The university stopped the research in October 2006 after the National Institutes of Health (NIH) said a BSL-4 lab was required, even though the university disagreed, according to UW-Madison officials. The NIH was funding the research. Who, besides "terrorists," would want to "engineer" a weaponized bird flu virus in the first place? Thus began the "War on Cancer"
King says that in the year 2000, scientists at the CDC and elsewhere began crossing H5N1 bird flu and H3N2 human flu to see if they could make bird flu directly transmissible between humans. In 2010, a research team led by the University of Wisconsin-Madisonâ€™s Yoshihiro Kawaoka announced it had created all the 254 possible hybrids of H5N1 and H3N2. Twenty-two of the genetically engineered mutations were even deadlier than the parent bird flu strain, and many were directly transmissible between humans. Researchers at the CDC and elsewhere also reconstituted from scratch the â€œextinctâ€� 1918 flu, believed to have killed more than 50 million people worldwide. Some of this research was also done in BSL-3 labs, King says. Since that time, researchers at multiple institutions have been at work genetically engineering hybrids of the 1918 flu. The numbers of BSL-3 labs in the US exploded after 2001, rising from 200 or so to over 1356. Government Accountability Office experts testified in 2007 that oversight for the labs and their 15,000 or so new researchers is spotty. While the New York Times is calling for an influenza virus created in an academic research lab in the Netherlands to either be destroyed or moved to government-controlled laboratories with the highest containment rating because of the danger the virus poses, little is known publicly about another contagious virus engineered in a University of Wisconsin-Madison lab. But a UW-Madison spokesman said Monday that the level of biosecurity surrounding the H5N1 avian influenza virus in the UW lab was approved by the U.S. Centers for Disease Control and Prevention and the U.S. Department of Agriculture Animal and Plant Health Inspection Service, which regulates genetically engineered organisms. The UW lab is classified as a Biosafety Level 3Ag lab (BSL 3Ag), one step below the highest containment rating. The UW study led by a world-renowned bird flu researcher in the School of Veterinary Medicine was funded in part by the National Institute of Allergies and Infectious Diseases, "which suggests they were well aware of the type of work being done here," said Terry Devitt, a UW-Madison spokesman. The transmission experiments in the BSL 3Ag suite were conducted in micro isolator cages to contain the agent, he said. The initial generation of the virus and processing of animal samples was done at a BSL-3 enhanced lab, Devitt said. "Yes, we are approved by the federal government to work with H5N1 at that level of containment." Researchers have been working to better understand how the virus could be stopped if it mutated in nature to become highly contagious among humans. It currently is only spread directly from animals to people. Avian influenza, or bird flu as it is commonly called, could become deadlier than smallpox before that disease was eradicated, critics contend. The New York Times in an editorial Sunday called for the H5N1 influenza virus created in the Netherlands to be destroyed or moved to government-controlled laboratories with the highest containment rating, known as Biosafety Level 4, because it could kill tens or hundreds of millions of people if it escaped confinement or was stolen by terrorists. Texas Biomedâ€™s Department of Virology and Immunology develops vaccines and therapeutics against highly lethal viral pathogens, and determines how they replicate and spread through basic and applied research. To defeat viruses that cause AIDS, hepatitis, herpes, hemorrhagic fevers, and a host of other illnesses, our scientists approach viruses on two different fronts. First, they examine how viruses replicate and propagate in order to identify their vulnerability. Second, they study how the immune system recognizes a virus and how best to stimulate immune response to clear viral infections. Texas Biomed has had a BSL4 maximum containment laboratory since 2000. We have worked on the development of countermeasures against BW agents, now called select agents. We have also placed a great deal of resources in developing therapies and vaccines against naturally occurring pathogens that can cause sporadic but lethal outbreaks. Texas Biomed has developed two vaccines against Ebola, one with Emory University and one with Crucell pharmaceuticals which are under going further studies. We have also worked with the University of Maryland on the development of two vaccines against Lassa fever. Lassa fever is a hemorrhagic fever which causes serious outbreaks in West Africa; more than 500,000 persons are infected every year with approximately a 10% fatality rate and many different forms of lasting effects. We have worked on the development of repurposing of drugs that have been already approved by the FDA for other diseases and are now being tested to check for any anti-microbial activities. This type of drug development is extremely fast and extremely inexpensive when looking for newer and better drugs, the cost of the R&D, and safety and efficacy studies are dramatically decreased. The BSL4 laboratory is utilized by the federal agencies, DOD, NIH, FDA and FBI for studies that require specific capabilities. It is also utilized by pharmaceutical companies for testing of new treatments and vaccines against all highly lethal and contagious pathogens. Virology. 2009 Jan 5;383(1):12-21. Epub 2008 Nov 4. Protection against lethal challenge by Ebola virus-like particles produced in insect cells. Sun Y, Carrion R Jr, Ye L, Wen Z, Ro YT, Brasky K, Ticer AE, Schwegler EE, Patterson JL, Compans RW, Yang C.
Ebola virus-like particles (VLPs) were produced in insect cells using a recombinant baculovirus expression system and their efficacy for protection against Ebola virus infection was investigated. Two immunizations with 50 microg Ebola VLPs (high dose) induced a high level of antibodies against Ebola GP that exhibited strong neutralizing activity against GP-mediated virus infection and conferred complete protection of vaccinated mice against lethal challenge by a high dose of mouse-adapted Ebola virus. 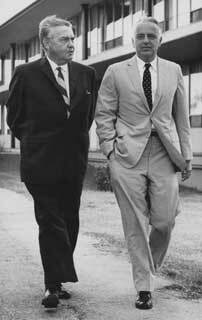 Founder Tom Slick with the Institute's first president, Dr. Harold Vagtborg. Himself a successful inventor and deeply interested in the ideals of scientific research, Tom Slick created a series of research organizations to meet the challenge to better mankind. After graduating from college, he decided to â€œrealize in bricks and mortar the nonprofit approach to scientific researchâ€� that had always fired his imagination. On December 16, 1941, when he was only 25, he established the Foundation of Applied Research (FAR) by a trust indenture. Endowed with 1,875 shares of the Slick-Urschel Oil Company, FAR's mission was to provide fundamental research and advanced education, covering agricultural research, the natural sciences and medicine. FAR's name was changed in 1952 to the Southwest Foundation for Research and Education, succeeded by the Southwest Foundation for Biomedical Research in 1984. In 2011, the name was changed to Texas Biomedical Research Institute. The occurrence of viable Cenozoic microorganisms within the permafrost is intriguing because an analysis of their features may provide a window into microbial life as it was before the impact of humans. The first study was carried out in eastern Arctic, where microbial populations of modern tundra soil and ~3 million years old permafrost were tested for their resistance to antibiotics. ampicillin, trimethoprim and bacitracin) than the modern populations, and the pattern of antibiotic sensitivity in permafrost was clearly very different from any that have been seen in a wide variety of modern soils studied (Tiedje et al. 1994). Recently, strains resistant to the following antibioticsâ€”chloramphenicol, streptomycin, kanamycin, gentamicin, tetracycline, spectinomycin, neomycinâ€”were isolated from permafrost. The analyses of these strains indicate the presence of all types of mobile elements known among modern bacteria: plasmids, insertion sequence elements, transposons and, probably, integrons. For example, among streptomycin resistant bacteria from permafrost, strains that contain well studied and wide spread transposon Tn5393 with streptomycin-resistance genes were found. This indicates that antibiotic resistance was common in microbial communities well before the commercial use of antibiotics. The cause of such enhanced antibiotic resistance is not clear, however it may be suggested that a generalized response of the community to in situ stresses, e.g., freezing and starvation, may also protect bacteria from some antibiotics. GENEVA/LONDON (Reuters) - Two studies showing how scientists mutated the H5N1 bird flu virus into a form that could cause a deadly human pandemic will be published only after experts fully assess the risks, the World Health Organization (WHO) said on Friday. Speaking after a high-level meeting of flu experts and U.S. security officials in Geneva, a WHO official said an deal had been reached in principle to keep details of the controversial work secret until deeper risk analyses could be carried out. The only NSABB member attending the meeting was infectious disease expert Paul Keim of Northern Arizona University and he "got the hell beat out of him," the source said. "It was a closed meeting dominated by flu people who have a vested interest in continuing this kind of work," he added. Is The Armageddon Strain From Sharon Gilbert's Book About To Be Released? The altermedia net is buzzing with rumors of a mutated SARS or avian flu in Baoding Hospital No. 252, Hebei province. The CDC is denying this report, calling it nothing more than net hysteria. While itâ€™s possible that itâ€™s much ado about nothing, it should be noted that Hebei province has suffered from severe bouts of H5N1 since early February, to the degree that egg demandâ€“for fears of transmissionâ€“has plummeted. According to an article posted yesterday at sina.com, children are the latest victims: â€œRecently, a fever of children really, we pay more attention to our children have lost several a few days fluid.â€� Recently, the provincial capital of Miss Shi telling everyone that. The data from the hospital confirmed the feelings of Miss Shi: Since last Saturday, the provincial capital of patients with flu-like fever surge on outpatients has more than doubled the previous week. The Atlantic online (Feb. 16) features this question: Shouldn't regular citizens be able to weigh in on whether scientists are allowed to play with a virus that could kill a third of the population? Writer Pagan Kennedy's answer, summarized in the headline: Good luck. Unfortunately, that feared virus may already exist. Two forms of the virus residing in two laboratories, one in the Netherlands and one in Wisconsin, may be highly contagious and highly deadly in humans, but we have evidence only from a good animal model for influenza viruses. We'll never know if it would be as deadly in humans simply because we cannot infect humans to get the proof. Those who have been sounding the alarm are among the world leaders in molecular biology, microbiology, virology, public health and microbial genetics. Dr. Paul Keim was quoted in the journal Science in November: "I can't think of another pathogenic organism that is as scary as this one.... I don't think anthrax is scary at all compared to this." Mount Sinai School of Medicine virologists find signs of infection in 1-2% of blood samples screened, but most people didn't seek or need treatment. February 23, 2012, 4:48 p.m. The World Health Organization says the H5N1 bird flu kills nearly 60% of people who become infected, but a study released Thursday suggests the true fatality rate may actually be much lower. Virologists at the Mount Sinai School of Medicine in New York City examined data on blood samples collected from more than 12,000 people in Asia, Europe and Africa and found evidence of H5N1 infection in 1% to 2% of cases. Most of those people did not become ill with the flu, according to a report in the journal Science, and none of them died. "You could reduce the seriousness of this virus twentyfold and it would still exceed that of the 1918 Spanish flu," said Michael T. Osterholm, director of the Center for Infectious Disease Research and Policy at the University of Minnesota. The H1N1 flu responsible for the 1918 outbreak had a fatality rate of about 2%. But it killed as many as 50 million people worldwide because it spread easily between people. In December, fears of an H5N1 pandemic led a U.S. government biosecurity advisory board to seek restrictions on the publication of that research. The request angered scientists who said they needed to share their findings in order to develop vaccines and prepare for a possible pandemic. But the biosecurity panel, of which Osterholm is a member, said the data could be dangerous if it wound up in the wrong hands. Scientists and public health officials are still debating how to proceed. Last week, the flu researchers agreed to continue a moratorium on the research and further delay publication of their findings while the issues are sorted out. Large numbers of birds are destroyed or die. Control measures disrupt trade of poultry products from affected areas. Prices of retail poultry products may increase significantly. The Hong Kong epidemic of 1997 and the associated human cases demonstrate the ability of the virus to affect humans and birds. The Grim Reaper, the name given to carriers of the plague in days of old. There is a legend that before the villages were hit with the plague, men in hooded capes carrying what appeared to be a sickle on the outskirts of their village, thus the grim reaper fable began. Off subject a tad sorry,,, panademics, plagues, black death, litterally human extermination, the ultimate in high tech genocide. We can assume if this method of decreasing global population is used it will be said terrorists developed this strain or stole the formulas that our Gov allowed to be developed. WTF. After the world was hit by the H1N1 pandemic in 2009-2010, the first ever in 40 years, the WHO came under scanner for slow distribution of vaccine in developing countries, but with the news that global production of seasonal flu vaccine is expected get double to 1.7 billion by 2015 was a proud moment for them. According to United Nations Agency, if a new flu epidemic would explode, then 37 vaccine makers including 11 new manufacturers coming in developing countries have the potential to triple their annual production to formulate 5.4 billion doses of pandemic vaccine. The amount of vaccine depended on, the yield of vaccine grown in the egg and how much of active ingredient â€“adjuvant to be used in pandemic vaccine. According to an independent review panel report on WHO for last year, it was declared that the world was not prepared to handle severe pandemic. Dr. Pathom Sawanpanyalert, Thailand's Chair of the WHO's Global Action Plan for Influenza Vaccines, has affirmed that flu vaccine would be used a tool to combat influenza pandemic. After months of anticipation, the second of two controversial experiments to increase the virulence of H5N1 avian influenza has been published. Many scientific questions are raised by the findings, and the same safety concerns remain that provoked massive public outcry and a temporary halt to the research. But if there were any doubts about H5N1′s ability to become airborne, theyâ€™re gone. ...Calculating the risks and benefits of these experiments, along with experiments that made H5N1 more virulent by mixing it with the pandemic 2009 flu strain, is a complicated and controversial matter. Supporters of the research argue that potential benefits outweigh the risks, which are enormous. Beyond giving recipes to would-be bioterrorists, accidental disease exposures at high-security research laboratories are not uncommon, and flu is extraordinarily difficult to control. Some researchers put H5N1′s human mortality rate at 60 percent, a number likely inflated by epidemiologists overlooking cases that lack severe symptoms. But a mortality rate of just 2.5 percent killed 40 million people in the 1918 pandemic. Should the findings prove less useful than expected, justification for H5N1 engineering would evaporate. If the findings do prove useful, thereâ€™s still powerful disagreement over how the research should be conducted. Many critics say H5N1 experiments should be restricted to a few highly skilled people in the worldâ€™s most secure laboratories. The National Institutes of Health is currently drafting formal policies to handle this and other potentially dangerous research, a task that should have been completed years ago. The results of Fouchier's experiment are published today in Science. Last month, Yoshihiro Kawaoka at the University of Wisconsin-Madison published details of another form of the bird flu virus that can pass between people, which was created by merging a mutated strain with the swine flu virus that sparked a human pandemic in 2009. In an accompanying study in Science, Derek Smith, professor of infectious disease informatics at the University of Cambridge, used computer and mathematical models to work out whether the types of virus created by Fouchier and Kawaoka could ever occur naturally. 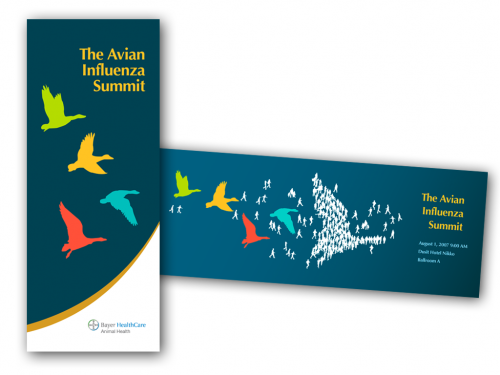 Smith's team analysed surveillance data on avian H5N1 viruses from the past 15 years and found that two of the required five mutations from the modified viruses had already occurred in existing strains. His team also showed that it was possible for a virus to evolve the three remaining mutations in a single host. Evolving four or five extra mutations would be more difficult but Smith was unable to quantify that risk. "We now know that we're living on a fault line," said Smith. "What we have discovered in this working collaboration with Drs. Fouchier and Kawaoka is that it's an active fault line." The step signals an end to formal US government opposition to full publication of the two papers authored by Yoshiro Kawaoka, DVM, of the University of Wisconsin and Ron Fouchier, PhD, of Erasmus Medical Center in the Netherlands. But the Dutch government has been using export-control laws to stop Fouchier from submitting his revised manuscript to Science. Kawaoka's study is expected to be published in Nature. In a statement today, NIH Director Francis Collins, MD, PhD, announced his endorsement of the recent recommendations by the National Science Advisory Board for Biosecurity (NSABB) that the two studies be published in full. The NSABB made the recommendations on Mar 30, reversing its December recommendation that the journals should withhold details of the studies, out of concern that malefactors or irresponsible scientists might misuse them and endanger public health. "The HHS Secretary [Health and Human Services Secretary Kathleen Sebelius] and I concur with the NSABBâ€™s recommendation that the information in the two manuscripts should be communicated fully and we have conveyed our concurrence to the journals considering publication of the manuscripts," Collins said. "This information has clear value to national and international public health preparedness efforts and must be shared with those who are poised to realize the benefits of this research. "The Secretaryâ€™s decision takes account of relevant US law, international obligations, and a rigorous analysis of the benefits and risks of publication," he said. "The work in the Netherlands by Ron Fouchier is subject also to laws and regulations of the Netherlands, and the Dutch government is conducting its own review of Dr. Fouchierâ€™s work. We respect that process and value the dialogue we have with Dutch authorities toward our common goals of encouraging scientific inquiry, advancing global health, and protecting the safety and security of our populations and the wider global community." MEXICO CITY (AP) -- ?An outbreak of the H7N3 bird flu virus in western Mexico has infected about 2.5 million chickens and led authorities to destroy or dispose of almost a million birds. Flu was confirmed in birds at 24 of the sites, and tests continued on most of the rest. WHO changed the definition of Pandemic RIGHT BEFORE H1N1 magically appeared! avian influenza virus genes whose proteins differ only a few amino acids from the 1918 pandemic influenza virus, suggesting that 1918-like pandemic viruses may emerge in the future. To assess this risk, we generated and characterized a virus composed of avian influenza viral segments with high homology to the 1918 virus. This virus exhibited pathogenicity in mice and ferrets higher than that in an authentic avian influenza virus. 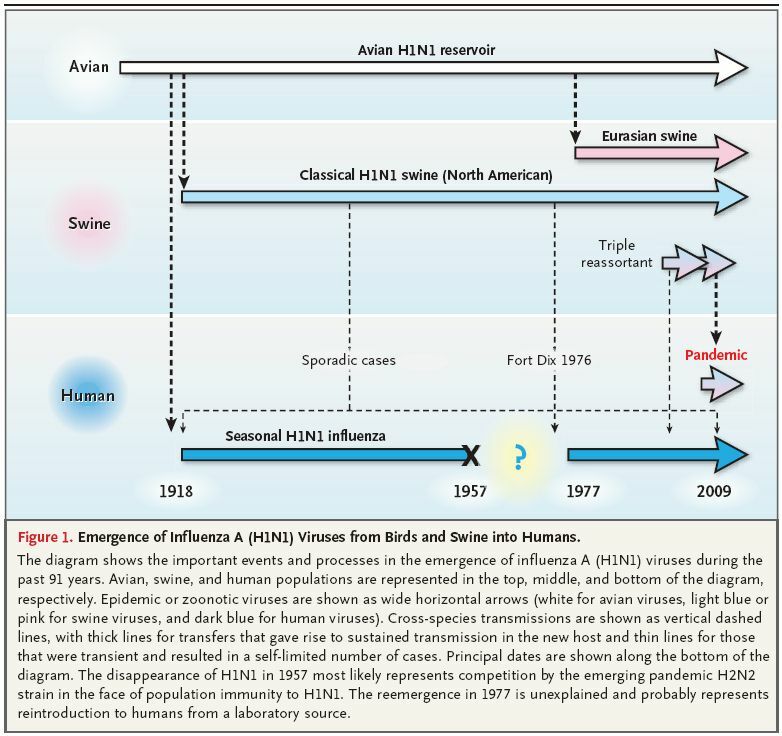 Further, acquisition of seven amino acid substitutions in the viral polymerases and the hemagglutinin surface glycoprotein conferred respiratory droplet transmission to the 1918-like avian virus in ferrets, demonstrating that contemporary avian influenza viruses with 1918 virus-like proteins may have pandemic potential. A handful of key mutations could be all it takes to allow a 1918-like virus to spread freely between humans, scientists believe. Researchers tested the ability of a reverse-engineered 1918-like virus made from components circulating in birds. This was then transmitted to ferrets, whose susceptibility to flu mimics that of humans. â€˜The worst-case scenario is the emergence of a novel avian influenza virus that exhibits high pathogenicity in humans, like H5N1 (avian flu) viruses, and efficient transmissibility in humans, like seasonal influenza viruses,â€™ said U.S. lead scientist Professor Yoshihiro Kawaoka, from the University of Wisconsin-Madison. After critics called for his high-security research to be stopped, he defended the work, insisting it had potentially 'life-saving benefits'. The transmission studies were conducted in a special high containment facility at the University of Winsconsin-Madison. Model also links avian influenza strains to deadly horse flu. Worobey and his colleagues analysed more than 80,000 gene sequences from flu viruses isolated from humans, birds, horses, pigs and bats using a model they developed to map evolutionary relationships between viruses from different host species. The branched tree that resulted showed that the genes of the deadly 1918 pandemic virus are of avian origin. Birds have been implicated in the deadly strainâ€™s origins before. A 2005 genetic analysis of the 1918 pandemic virus pulled from a victimâ€™s preserved tissue concluded that it most closely matched viruses of avian origin2. 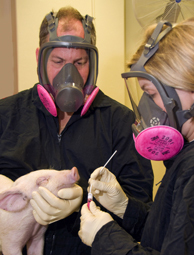 But a 2009 study3 found instead that the viral genes circulated in humans and swine for at least 2 to 15 years before the pandemic and combined to make the lethal virus. Gavin Smith, an evolutionary biologist at Duke-NUS Graduate Medical School at the National University of Singapore, calls the current study â€œan important contribution to how we analyse dataâ€�. Smith, a co-author of the 2009 study, notes that it identified an avian relationship for two genes in the 1918 virus, but not for six genes, as the latest study has done. The analysis also reveals a shared ancestor for almost all avian flu strains and an H7N7 virus that struck down horses and mules throughout North America in 1872. The panzootic outbreak began in Toronto, Canada, and quickly spread south and west. Newspapers reported â€œnearly desertedâ€� streets in Washington DC and freight piling up at railroad depots and piers in Philadelphia, Pennsylvania. â€œTransmission between horses and humans seems to have been key to some epidemics when horses were an intimate part of our lives,â€� says Richard Lenski, an evolutionary biologist at Michigan State University in East Lansing. Michael Imperiale, chair of the report committee, and professor of microbiology and immunology at the University of Michigan, said the review used only unclassified information and so has no assessment of which groups, if any, might be pursuing novel biological weapons. ?We can?t say how likely any of these scenarios are,? he said. ?But we can talk about how feasible they are. ?